Stats: 50 metres, Ortona Navi, 2008, 12 guests, 12 crew Highlights: Refitted in 2014, Resilience is perfect for chartering with large groups or families. Her sundeck is ideal for soaking up the Mediterranean sun and features a Jacuzzi, sun pads, a bar and lounge with ample space to host drinks for parties of up to 80. Inside, her striking, artistic interior design showcases a number of impressive modern artworks, sculptures and photography, as well as bold soft-furnishing prints throughout. For water-sport enthusiasts, a charter on board Resilience is sure to please; she carries waterskis, wakeboards, jetskis and diving equipment, plus an array of towable toys and inflatables. Resilience is managed for charter by Camper and Nicholsons with a weekly summer charter rate starting from €160,000. Highlights: Refitted in 2014, Resilience is perfect for chartering with large groups or families. Her sundeck is ideal for soaking up the Mediterranean sun and features a Jacuzzi, sun pads, a bar and lounge with ample space to host drinks for parties of up to 80. Inside, her striking, artistic interior design showcases a number of impressive modern artworks, sculptures and photography, as well as bold soft-furnishing prints throughout. For water-sport enthusiasts, a charter on board Resilience is sure to please; she carries waterskis, wakeboards, jetskis and diving equipment, plus an array of towable toys and inflatables. Resilience is managed for charter by Camper and Nicholsons with a weekly summer charter rate starting from €160,000. 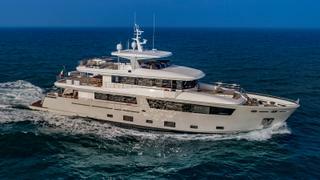 Stats: 33.9 metres, Cantiere Delle Marche, 2019, 12 guests, 6 crew Highlights: Launched in October, Mimi La Sardine is a brand new offering for the charter market. 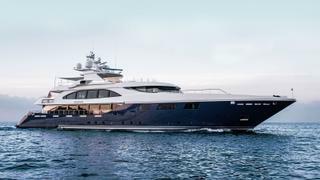 Designed by Nauta Yachts, Mimi La Sardine also arrives as winner of Boat International’s Interior Designer Award. Her elegant wood interiors featured earthy-toned wicker furniture and are embellished with gilded touches throughout. Spanning over three decks, Mimi La Sardine has ample lounge space with adaptable indoor/outdoor dining areas. Highlights include the upper deck with its barbeque, bar and formal dining table, while her range of water toys to keep guests entertained. Mimi La Sardine is managed for charter by Ocean Independence with a weekly summer charter rate starting from €115,000. Highlights: Launched in October, Mimi La Sardine is a brand new offering for the charter market. Designed by Nauta Yachts, Mimi La Sardine also arrives as winner of Boat International’s Interior Designer Award. Her elegant wood interiors featured earthy-toned wicker furniture and are embellished with gilded touches throughout. Spanning over three decks, Mimi La Sardine has ample lounge space with adaptable indoor/outdoor dining areas. Highlights include the upper deck with its barbeque, bar and formal dining table, while her range of water toys to keep guests entertained. Mimi La Sardine is managed for charter by Ocean Independence with a weekly summer charter rate starting from €115,000. Stats: 82 metres, Oceanco, 2007, 12 guests, 27 crew Highlights: Sprawling over four decks, this expansive motor yacht is the ideal party charter yacht. Refitted in 2017, her honey-hued interiors are designed by Alberto Pinto and provide ample lounging space. Entertainment and ambience are provided by a grand piano and hi-tech audio-visual systems, while relaxation can be found in the spa, beauty salon, or sauna. On deck, Alfa Nero features a Jacuzzi, helipad and an innovative seven metre swimming pool which can convert into a dance floor. Alfa Nero is managed for charter by Burgess and her weekly summer charter rate starts from €812,000. Highlights: Sprawling over four decks, this expansive motor yacht is the ideal party charter yacht. Refitted in 2017, her honey-hued interiors are designed by Alberto Pinto and provide ample lounging space. Entertainment and ambience are provided by a grand piano and hi-tech audio-visual systems, while relaxation can be found in the spa, beauty salon, or sauna. On deck, Alfa Nero features a Jacuzzi, helipad and an innovative seven metre swimming pool which can convert into a dance floor. 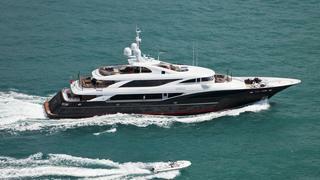 Alfa Nero is managed for charter by Burgess and her weekly summer charter rate starts from €812,000. Stats: 28.32 metres, Benetti, 2014, 10 guests, 5 crew Highlights: Gala is ideal for guests who want to spend their time in the water. Alongside a glitzy, on-deck Jacuzzi, Gala is decked out with a multitude of water-toys such as paddle boards, water-skis, a wakeboard, seabobs and snorkelling gear. She also features an outdoor cinema with a wide-screen television, perfect for a relaxing evening under the stars. Gala’s interiors are designed with a fresh and simple palette, infused with bright pops of colours throughout her various sleeping, lounging and dining areas. Gala is managed for charter by Fraser with a weekly summer charter rate starting from €69,000. Highlights: Gala is ideal for guests who want to spend their time in the water. Alongside a glitzy, on-deck Jacuzzi, Gala is decked out with a multitude of water-toys such as paddle boards, water-skis, a wakeboard, seabobs and snorkelling gear. She also features an outdoor cinema with a wide-screen television, perfect for a relaxing evening under the stars. Gala’s interiors are designed with a fresh and simple palette, infused with bright pops of colours throughout her various sleeping, lounging and dining areas. Gala is managed for charter by Fraser with a weekly summer charter rate starting from €69,000. 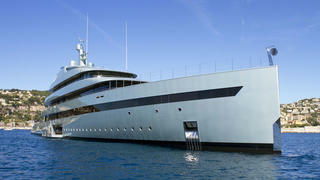 Stats: 50 metres, ISA, 2011, 12 guests, 11 crew Highlights: Liberty is known for her distinct interior design. Inspired by marine life, each of the spacious staterooms, designed by Rene Van Der Velden, is themed by a different sea creature, from tortoises and seahorses to starfish and coral. Liberty’s interiors are not her only selling point, though. She also has an easily adaptable deck with generous lounging and dining spaces and comes fully equipped with an armada of water toys including paddleboards, knee and wake boards, inflatable water toys, a pair of sea bobs and jetskis. Plus, an outdoor projector and 100-inch screen can be set up on deck for al fresco movie nights. Liberty is managed for charter byNorthrop & Johnson with a weekly summer charter rate starting from €235,000. Highlights: Liberty is known for her distinct interior design. Inspired by marine life, each of the spacious staterooms, designed by Rene Van Der Velden, is themed by a different sea creature, from tortoises and seahorses to starfish and coral. Liberty’s interiors are not her only selling point, though. She also has an easily adaptable deck with generous lounging and dining spaces and comes fully equipped with an armada of water toys including paddleboards, knee and wake boards, inflatable water toys, a pair of sea bobs and jetskis. Plus, an outdoor projector and 100-inch screen can be set up on deck for al fresco movie nights. Liberty is managed for charter byNorthrop & Johnson with a weekly summer charter rate starting from €235,000. Stats: 39 metres, Vitters, 2009, 8 guests, 5 crew Highlights: With a sleek exterior and unrivalled sailing performance, G2 is the ideal charter yacht for sailing enthusiasts. Newly refitted in 2018, she has upgraded navigational systems and new carbon fibre rigging for the ultimate experience at sea (and she is able to reach max speed of 16 knots). Her light and spacious interior is designed in a contemporary style, and onboard highlights include the saloon’s skylight and secluded cinema area. G2's open flush deck features al fresco dining and lounge areas and she also equipped for sports such as water-skiing, snorkelling or diving. G2 is managed for charter by YPI with a weekly summer charter rate starting from €85,000. Highlights: With a sleek exterior and unrivalled sailing performance, G2 is the ideal charter yacht for sailing enthusiasts. Newly refitted in 2018, she has upgraded navigational systems and new carbon fibre rigging for the ultimate experience at sea (and she is able to reach max speed of 16 knots). Her light and spacious interior is designed in a contemporary style, and onboard highlights include the saloon’s skylight and secluded cinema area. G2's open flush deck features al fresco dining and lounge areas and she also equipped for sports such as water-skiing, snorkelling or diving. G2 is managed for charter by YPI with a weekly summer charter rate starting from €85,000. Stats: 59.66 metres, Benetti, 2009, 12 guests, 15 crew Highlights: Refitted in 2017, Andiamo boasts majestic interiors and ample living spaces. Design highlights include a palatial, marble-floored foyer and elegant spiral staircase. A bar, game table, Jacuzzi and al fresco dining areas can all be found on the upper decks of Andiamo. This Benetti superyacht is also perfect for a wellness charter; an air-conditioned gym is located on the sundeck. For relaxation, guests can take advantage of the on-board masseuse, the beach club sauna, or relax on the sun pads, before being served up dinner by Andiamo’s award-winning chef. Andiamo is managed for charter by IYC with a weekly summer charter rate starting from €375,000. Highlights: Refitted in 2017, Andiamo boasts majestic interiors and ample living spaces. Design highlights include a palatial, marble-floored foyer and elegant spiral staircase. A bar, game table, Jacuzzi and al fresco dining areas can all be found on the upper decks of Andiamo. This Benetti superyacht is also perfect for a wellness charter; an air-conditioned gym is located on the sundeck. For relaxation, guests can take advantage of the on-board masseuse, the beach club sauna, or relax on the sun pads, before being served up dinner by Andiamo’s award-winning chef. Andiamo is managed for charter by IYC with a weekly summer charter rate starting from €375,000. Stats: 55 metres, Heesen, 2011, 12 guests, 11 crew Highlights: From a sun deck sauna and fully equipped gym, to an enormous master suite and aft deck pool, Quite Essential is packed with every luxury feature you could wish for. The main deck aft is perfect for entertaining and features a bar, U-shape sofa and a spa pool with a clever waterfall feature which doubles as a screen to project films onto, while her sun deck sauna and massage room provide a haven of relaxation. Her Ken Friekovh and Michela Reverberi interior can sleep up to 12 guests in six cabins, including her full-beam master suite which is one of the largest seen on a yacht of this size, complete with side balconies, a private office, and walk-in wardrobe. She also houses a standout glass staircase which encircles a glass elevator. Quite Essential is managed for charter by Yachtzoo with a weekly summer charter rate starting from €265,000. Highlights: From a sun deck sauna and fully equipped gym, to an enormous master suite and aft deck pool, Quite Essential is packed with every luxury feature you could wish for. The main deck aft is perfect for entertaining and features a bar, U-shape sofa and a spa pool with a clever waterfall feature which doubles as a screen to project films onto, while her sun deck sauna and massage room provide a haven of relaxation. Her Ken Friekovh and Michela Reverberi interior can sleep up to 12 guests in six cabins, including her full-beam master suite which is one of the largest seen on a yacht of this size, complete with side balconies, a private office, and walk-in wardrobe. She also houses a standout glass staircase which encircles a glass elevator. Quite Essential is managed for charter by Yachtzoo with a weekly summer charter rate starting from €265,000. 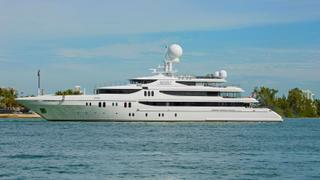 Stats: 83.5 metres, Feadship, 2015, 12 guests, 24 crew Highlights: This 83 metre Feadship is truly a floating palace. Manned by 24 crew members, a charter with Savannah will ensure first-class treatment for up to 12 guests on board. Her expansive rosewood interiors are complemented by a modern art collection and eye-catching spiral staircase. Her modern design uses glass throughout to provide light and unbeatable views. The most impressive feature on board Savannah is her underwater observation lounge, followed by a nine-metre swimming pool. Alongside an armada of water toys and sports equipment, Savannah boasts an onboard basketball court and jumbo inflatable water slide. A masseuse and beautician are also available to guests during their stay. 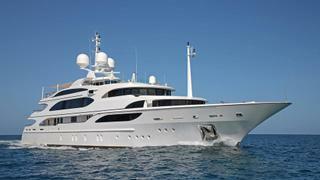 Savannah is managed for charter by Edmiston with a weekly summer charter rate starting from €1,000,000. Highlights: This 83 metre Feadship is truly a floating palace. Manned by 24 crew members, a charter with Savannah will ensure first-class treatment for up to 12 guests on board. Her expansive rosewood interiors are complemented by a modern art collection and eye-catching spiral staircase. Her modern design uses glass throughout to provide light and unbeatable views. The most impressive feature on board Savannah is her underwater observation lounge, followed by a nine-metre swimming pool. Alongside an armada of water toys and sports equipment, Savannah boasts an onboard basketball court and jumbo inflatable water slide. A masseuse and beautician are also available to guests during their stay. 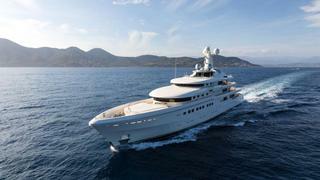 Savannah is managed for charter by Edmiston with a weekly summer charter rate starting from €1,000,000. Stats: 27 metres, Mochi Craft, 1997, 8 guests, 4 crew Highlights: Seraph, refitted in 2018, enjoys cosy and warm interiors designed with mahogany and leather finishes. Her highlights include a Jacuzzi with protective overhead screening and a misting system to keep cool on hot summer days. She is fitted with a barbecue grill, al fresco dining areas and water toys such as jetskis and wakeboards. Fishing and snorkelling equipment is also available for Seraph’s guests. Seraph is ideal for intimate group charters, and her local Spanish captain will also provide guests with advice and insights for a memorable trip in the west Mediterranean. Seraph is managed for charter by CSO with a weekly summer charter rate starting from €30,000. Highlights: Seraph, refitted in 2018, enjoys cosy and warm interiors designed with mahogany and leather finishes. Her highlights include a Jacuzzi with protective overhead screening and a misting system to keep cool on hot summer days. 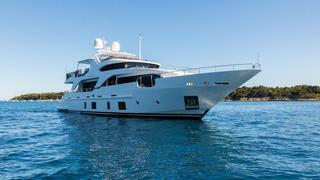 She is fitted with a barbecue grill, al fresco dining areas and water toys such as jetskis and wakeboards. Fishing and snorkelling equipment is also available for Seraph’s guests. Seraph is ideal for intimate group charters, and her local Spanish captain will also provide guests with advice and insights for a memorable trip in the west Mediterranean. 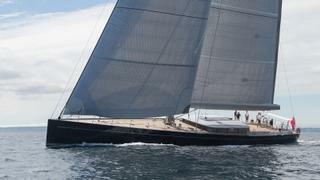 Seraph is managed for charter by CSO with a weekly summer charter rate starting from €30,000. Stats: 82 metres, Abeking & Rasmussen, 2015, 12 guests, 23 crew Highlights: RoMEA is a megayacht that boasts expansive living areas and decadent design. Her contemporary interiors include ornamental pieces of furniture, accentuated by the modern artwork and sculptures placed thought. Her main saloon features a grand piano and formal dining areas are available for both indoor and al fresco entertaining. RoMEA is ideal for a wellness charter; her beach club includes a jacuzzi and Finish sauna, as well as massage and beauty treatment rooms. For keeping guests entertained, RoMEA carries a pair of jestkis and seabobs and also has both indoor and outdoor cinema areas on board. 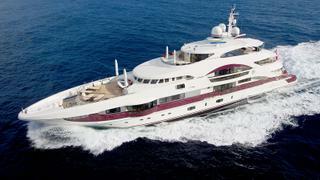 RoMEA is managed for charter by Imperial Yachts with a weekly summer charter rate starting from €875,000. Highlights: RoMEA is a megayacht that boasts expansive living areas and decadent design. Her contemporary interiors include ornamental pieces of furniture, accentuated by the modern artwork and sculptures placed thought. Her main saloon features a grand piano and formal dining areas are available for both indoor and al fresco entertaining. RoMEA is ideal for a wellness charter; her beach club includes a jacuzzi and Finish sauna, as well as massage and beauty treatment rooms. For keeping guests entertained, RoMEA carries a pair of jestkis and seabobs and also has both indoor and outdoor cinema areas on board. Stats: 65 metres, Codecasa, 2010, 12 guests, 17 crew Highlights: Double Down is designed with classic, lacquered mahogany interiors and her elegant main saloon with its grand piano are the central focus below deck. Refitted in 2016, Her highlights include a Jacuzzi, a barbecue and black out cinema. She also offers formal dining areas with indoor/outdoor options for unobstructed views, and a roomy glass elevator will assist guests as they move between Double Down’s four decks. Plenty of water sport equipment, fishing gear, a water trampoline and a host of towables also make Double Down ideal for a family charter. 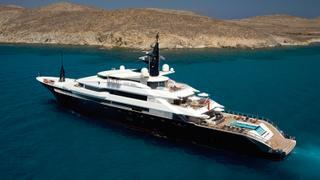 Double Down is managed for charter by Worth Avenue Yachts. She has a weekly summer charter rate starting from $415,000. Highlights: Double Down is designed with classic, lacquered mahogany interiors and her elegant main saloon with its grand piano are the central focus below deck. Refitted in 2016, Her highlights include a Jacuzzi, a barbecue and black out cinema. She also offers formal dining areas with indoor/outdoor options for unobstructed views, and a roomy glass elevator will assist guests as they move between Double Down’s four decks. Plenty of water sport equipment, fishing gear, a water trampoline and a host of towables also make Double Downideal for a family charter. Double Down is managed for charter by Worth Avenue Yachts. She has a weekly summer charter rate starting from $415,000.